Where do you begin when thinking of what jewellery to wear on your wedding day? After making an endless series of exciting and daunting decisions; this fabulous dress, that amazing venue, the colour scheme, the theme, the readings, the vows, the music, it’d be easy to become side tracked and miss out on the opportunity to wear something with real meaning that you can treasure forever to remind you of your special day. 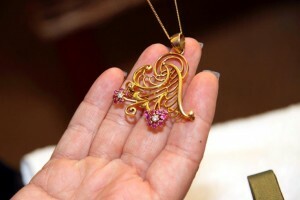 There is a whole world of romantic symbolism to explore, a wealth of styles, gemstones and precious metals to choose from. My starting point, and of course I’m biased in favour of antique and vintage jewellery, would be to ask; “Is there a family piece I can borrow?” Especially a ring or necklace or earrings that have been worn by other family members in the past, immediately fulfilling the “something old” and “something borrowed” criteria of the well- known saying. How lovely to walk down the aisle in the same necklace your own mum or grandma wore on her day. 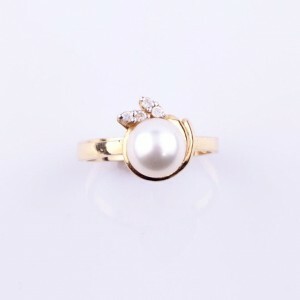 If not, I’d look at pearls as my next choice – real pearls, cultured pearls, glass pearls; who cares about value, it’s their meaning we are interested in, and the fact that regardless of personal styles and tastes, the regal pearl compliments most dresses, from the traditional big white number, through creams and pastels to bold dramatic reds, midnight blue or black. This Art Deco glass necklace would also fit the bill; with plaited strands of tiny fake pearls making up a stunning choker that would look beautiful with your “Great Gatsby” inspired gown. 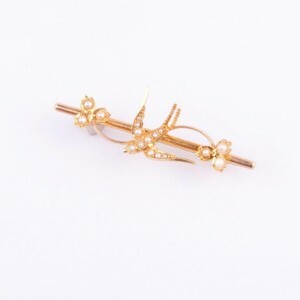 If you are an understated dresser, and have a chic, simple dress, think about adding a delicate brooch. Try something like this Edwardian gold and seed pearl swallow and clover leaf brooch. The swallow represents loyalty, as the swallow always flies home. The clover leaf represents the trinity of hope, love and faith – used together with the seed pearls this forms a pretty strong statement of romantic integrity! Next up is the bow or knot. Used in jewellery since Ancient Greek times, again in the French Court of the 17th century and beloved by the Victorians, the knot is a strong symbol of “strength in union” or “the ties of love binding us together”. 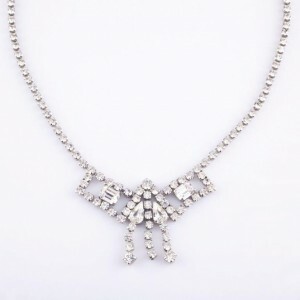 A symbolic piece of jewellery need not be expensive; you can pick up one of these 1950’s rhinestone necklaces for around £10-£20, this one has the bow/knot design and is in fabulous condition for something 60 plus years old. Another idea is to add a blue gemstone (sapphires, aquamarines, blue topaz) to your ensemble – for the “something blue”. 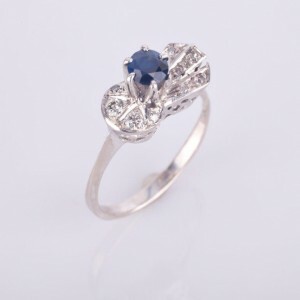 This sapphire and diamond ring from the 1940’s screams Hollywood glamour, and also carries the symbolism of the bow. Equally, having an adornment in yours or your partner’s birthstone, or perhaps your children’s birthstones is a fabulous personalised idea. 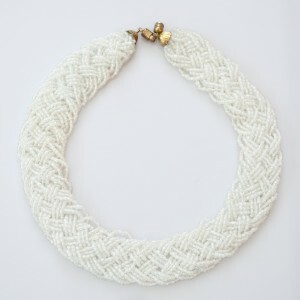 Of course, you may well want to wear something just for the sheer beauty or decorative effect it has. 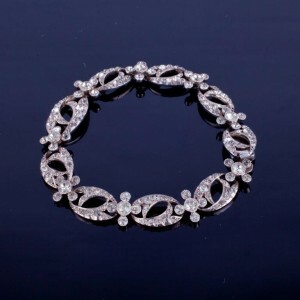 I’d plump for something wonderful like this heavy silver and pastes Art Nouveau bracelet, over 100 years old and utterly magnificent, a design that would compliment a vintavintage inspired dress, as much as it would a flamboyantly embellished modern dress. Finally, why not find a unique piece that allows you to write your own history and symbolism? I wore this necklace on my own big day, a gift from my husband to be. The Nouveau stylised “rose tree” represented our strength, the two flower heads represented our two children, whilst the diamonds symbolised “forever”. Being set with red rubies made it even more special, as not only is our daughter’s name Ruby Rose, but I’m a Lancashire lass, and in this piece I could wear the red rose of Lancashire with pride! So, whether you love the old or prefer shiny and new, be sure to pick a special piece of jewellery that is simply perfect for you. 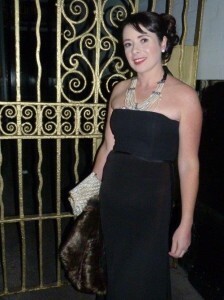 Here is a photo of our Alice at last year’s awards…apron off and make-up on!